Are you looking for a contemporary style memorial glass necklace to remember a loved one? There are so many wonderful options out there when it comes to the difficult decision of what to do with your loved ones’ ashes. Some choose earrings, some choose memorial glass rings, and some prefer to keep their loved one close to their heart on a necklace. The good thing about memorial glass necklaces is that they come in all shapes and sizes. I’ve recently introduced a memorial glass barrel necklace as a more contemporary choice, just to give another unisex option for my customers. Below, I’m going to talk you through my unique creation process for crafting a unisex barrel-style necklace, and why it might be a good option for you. Why choose a memorial glass barrel necklace? A barrel-style memorial glass design is quite a unique and contemporary jewellery piece, and I’m not even sure other online shops are selling one exactly the same as my own. I wanted to give people more choice of how to wear their memorial glass around their neck. The barrel necklace design is quite versatile; you can either wear it around your neck on a lovely section of urban leather, or you can choose to wear it on a Pandora chain, so it’s more like a pendant. In fact, one of my customers was looking for a piece of memorial jewellery recently, but almost didn’t buy anything as it all looked too feminine. However, he loved the design of the barrel necklace, and thought it would really suit him. Black tends to our most popular option. Firstly, you decide on the colour of barrel necklace you would prefer. Options can be found either online or in your order pack – however some companies (including myself) will be able to offer a custom colour of your choosing. Next, I heat up the coloured glass to around 1500 – 1400 degrees, so it becomes almost like a sort of honey texture. Then it’s time to capture the ashes within the glass, using heat and a combination of coloured and clear glass to seal it all in nicely. I wish I could take some credit for what happens next, but if I’m honest, the ashes from their own unique pattern in the glass. This is caused by a mixture of gases and air. Because of the different patterns formed, each piece is completely unique! 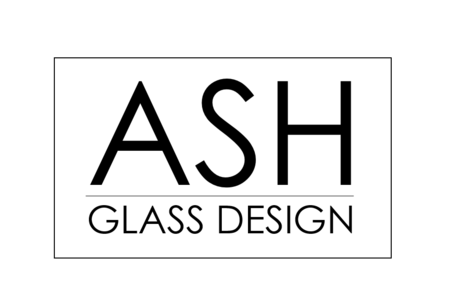 Once I’m happy with the way the ashes have taken to the glass, I use a slab of carbon to start rolling it out into the shape I want. This all takes experienced hands, as you have to really do it by eye. Afterwards, the barrel necklace sits in a kiln for around 24 hours, until it cools right back to room temperature. Then it’s ready for the next step! Almost there. Next, I use diamond wheels to grind and polish the sides, so they can be set in silver 925. This is it can be worn nicely with a leather strap or Pandora chain. The finishing touch! I add a good quality section of urban leather, and then it’s ready to be sent out to you. This is the part where I get in touch to let you know it’s ready, along with your final invoice. Your special barrel necklace is then sent out via recorded post. Memorial glass necklaces can typically take some of the larger companies up to 6 – 8 weeks to produce. This is most likely due to how many orders they have to process. Despite this, there are some smaller cremation glass companies out there who can produce memorial glass quicker. It can also add an extra personal touch to the process. Having been in this business for over 20 years, I know how important it is to have peace of mind. That’s why I like to get ashes back to my customers as soon as possible. My turnaround time at the moment is under two weeks, and I keep them updated throughout. 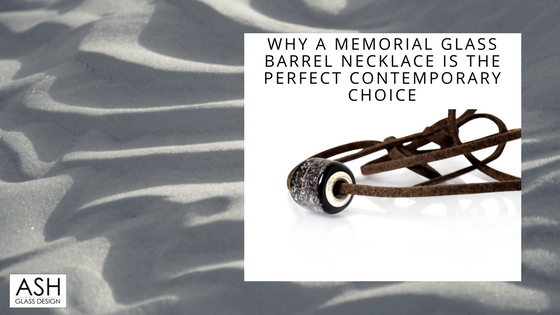 A contemporary-style memorial glass necklace like my barrel design should cost you around £100, but the price will vary from company to company. The best advice I can give you is to shop around carefully and find an experienced company that suits you budget but also reassures you that your loved ones’ ashes will be in safe hands. TIP: To help you out, here are 8 questions to ask a cremation glass company BEFORE ordering. It’s always better to be on the safe side with such a sensitive purchase. I’m sorry for your loss, but I hope this blog has helped give you a better idea of the creation process for contemporary style memorial glass necklaces, like my new barrel necklace. It’s a great unisex design that is certainly a bit different from the norm! If you have any questions, or need advice on finding the right style for you, please leave a comment below. I promise to answer!